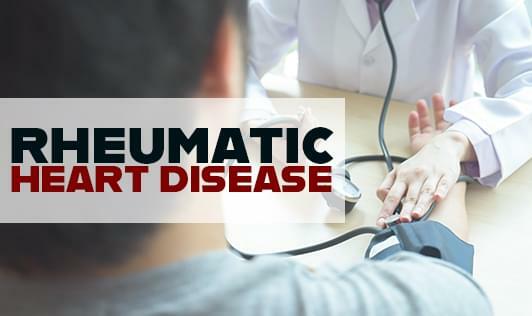 Rheumatic heart disease is a group of heart disorders that occur as a complication of rheumatic fever and it causes most of the cardiovascular mortality in young people. RHD can damage any part of the heart but mainly damages heart valves. The symptom of RHD depends on which part of the heart is affected and the severity of the damage. Here are some general symptoms which are mainly seen in a person who is suffering from RHD. It is very important to treat streptococcus infection and rheumatic fever properly with antibiotics in order to prevent RHD. Treatment includes the administration of antibiotics and non-steroidal anti-inflammatory drug. Treatment for rheumatic heart disease varies based on how much damage the heart has sustained. In severe cases, treatment may include surgery to replace or repair a badly damaged valve. If heart inflammation is diagnosed along with, or right after, rheumatic fever, your physician will prescribe antibiotics and anti-inflammatory medications to clear the infection and minimize heart damage. People who have had a rheumatic fever are sometimes prescribed daily or monthly antibiotic treatments to prevent future attacks of rheumatic fever and lower the risk of further heart damage. Bacterial endocarditis: This infection of the inner lining of the heart can occur when the rheumatic fever has damaged heart valves. Pregnancy and delivery complications: Women with rheumatic heart disease should consult with a physician about possible risks before getting pregnant. Ruptured heart valve: This medical emergency must be treated with surgery to replace the heart valve.